I remember reading once, in the nebulous thousands of articles of varied subjects that I’ve partaken of over the years, that the toughest part of starting any career is choosing the design of your business card. So I started simply. I knew that I didn’t want to use Vistaprint, because everyone uses Vistaprint – It’s simply that their prices are so cheap. Because of that, about half of their printed cards have on them the job title of “Hobo.” I went to a site I had created business cards at before, but never actually bought them, Moo. But then I thought, well, then it’s just another business card. The biggest problem, really, was that it had so much room for so much information, but I had so little to give – I had my name, my title, my email, my phone number, and my website on there – and there was still so much empty space! The other thing was that it really says nothing about me, other than that I potentially could be shown to have terrible handwriting! So I went shopping around for other designs. And then, I found it. And it wasn’t even in the business card section. They’re basically just business cards, but cut in half. Me – They’re great! They’re just like business cards, but half the vertical height. Anna – Aw, just like you. 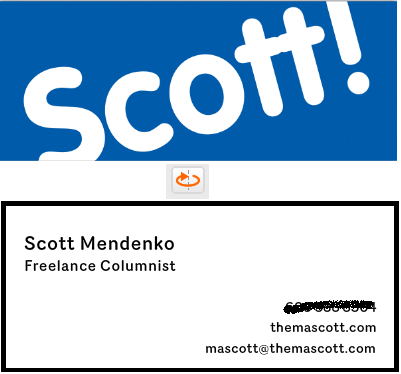 I realized that this was great – I had half the info on a business card, so why not get half a business card? There weren’t any pre-made designs I liked. I set about making my own. However, drawing a Mascott on the back of a business card seemed… tacky, so I wondered what I could do to beat “tacky.” I approached it as I would an awkward situation that I am determined to make not awkward. Sometimes you just have to go so far beyond “awkward” that it’s not even realistic for anyone to feel awkward anymore. If you thought that was ridiculous, you have no idea. I have twenty variations on this card in the box of 100 I bought. 3 different backgrounds, two different colors (orange and blue) and 3 different orientations of the text, and all of those in every possible combination. But in all seriousness, I realized that I don’t have a lot of backlogged content to show someone I might be giving my business card to. Sure, I’ve got my website, which has links to basically everything I’ve ever written on any site, but it’s not much. So if I’m going to sell myself, it’s because I have a borderline insane person’s business card that editors will remember. Fast forward to what I received in the mail today…. This entry was posted in Humor, Mascott. Bookmark the permalink. Post a comment or leave a trackback: Trackback URL.